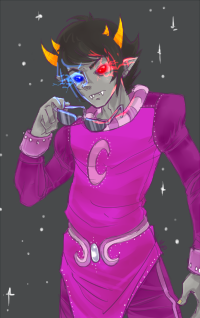 Before leaving the Royal Boy, Sollux decided it would be an appropriate time to start his diary. He had bought a little leather book with blank pages right after he was forced out of his home, in which he could record his adventures during what could either become the rebellion or the downfal of Derse, Prospit and skaia. 2o okay, thii2 ii2 my fiir2t attempt at thii2 2tupiid thiing they call a "diiary". 2eriou2ly, what kiind of iidiiot u2ually ha2 a freakiing diiary? who ju2t goe2 and wriite2 2tuff liike they're talkiing two them2elve2 iin 2ome 2ort of dumb memo thiingy, probably rantiing about theiir liive2 and what'2 goiing on around them? under normal ciircum2tance2, not me. ii don't know though, ii feel liike ii'd be2t keep track of what'2 goiing on riight now. thiing2 miight get ugly 2ooner or later. ii mean not that my memory ii2n't reliiable or anythiing liike that, my braiin ii2 probably the mo2t performant thiing around but ii ju2t want two have kiind of a memory back up here, ju2t iin ca2e 2omethiing happened to my um... mental data ba2e, ye2, let'2 call iit that. 2o, fiir2t off, ye2terday wa2 kiind of a weiird day. ii wa2 ju2t goiing two go around a liittle and try two fiind the re2ii2tance'2 headquarter, but ii ran iinto thii2 weiird carapace who turned out two be a human giirl. 2he'2 pretty dumb but ii gue22 2he'2 al2o pretty niice. ii mean 2he wa2en't a paiin iin the a22 or anythiing, ju2t a liitle biit 2low 2ometime2. ii don't thiink 2he went two 2chool con2iideriing 2he'2 from 2kaiia, but 2tiill 2he could really u2e 2ome general culture or 2omethiing. 2o yeah ii ran iinto her and we ended up workiing at the royal boy twogether and 2pendiing the niight here. iit wa2 a lot of trouble but no choiice, really. ii can't go 2leepiing out iin the 2treet2, bluh! iit2 diirty and cold. not only diid ii run iinto that female human, ii al2o 2aved her from another of her own race, a male. he looked pretty shady. actually that'2 how we ended up at the royal boy twogether. okay ii better 2top thii2 none2en2e riight away before iit 2tart2 2oundiing liike 2ome 2hiitty romantiic play. He closed the small book, gathered his things and departed from the pub.